There is a major bicycle / motorist education problem in this country, a problem we need to address soon as more and more cities are waking up to the “Bike-is-Transportation” reality. Part of the problem is the bike way-finding road sign network. At current we’re basically asking motorists to be nice with no clear action necessary for either party. Here we show a car whizzing by a cyclists! 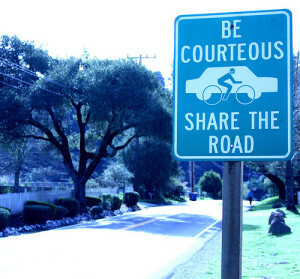 Driving by a Share the Road sign you might think, “Okay, I’ll watch out for cyclists.” But what does that actually mean? And shouldn’t we use more direct language like, “Shared Bike Lane Ahead” or “Bikes May Use Full Lane”? When you’re driving on the highway and come across a Watch for Deer sign, does it change your driving habits really, for long? Or do you just think, “Okay, I’ll watch out for deer.” I believe it’s the same way for bikes. Share the Road signs are like Watch for Deer signs for bikes. And as a result they’re mostly ignored. In part due to their vague meaning but more accurately due to their vague requirement for action. There’s no real action necessary for either party with these signs. What are your experiences with Share the Road signs? Do they work? Have some other suggestions? Tweet hashtag #ShareTheRoad to keep the conversation going. This avoids the bicyclists v. motorists scenario, and the primacy of one mode over another. If there’s no sidewalk, you might add an image of a pedestrian too. “Use left lane to pass” or “Change Lanes To Pass.” I find signage that avoids singling out bicyclists to be more compelling. Am I in a bubble?